These protein pancakes get a nutritional boost from cottage cheese and Greek yogurt! The recipe makes enough for just two people but you can easily double or even quadruple the recipe. Can be made gluten-free or whole grain. Protein pancakes don’t sound exactly appetizing but seriously… these are so good and you don’t need to be put off by the protein in the title! There’s lots of cottage cheese in these pancakes but all it does is make the pancakes less bready and more moist. I don’t know if I’ve ever mentioned this before, but I’m a terribly messy person. And this also applies to the fridge. I buy stuff intending to bake with it and then I get a different idea, buy more, get another idea, and so on. Today was get rid of the cottage cheese and Greek yogurt day. I’m not really into thick pancakes. I always spread them out with the measuring cup I used to pour them into the pan. These are SO soft. I don’t know if I would say fluffy, just because they’re so thin, but super soft. Just like my gluten-free Swedish pancakes and paleo buttermilk pancakes! Something else that I love about them is how good they are cold. I ate these from the fridge all day and they were awesome. I just couldn’t get my mind off of them. These have absolutely no added sugar of any type, but I didn’t even notice as I had some super flavorful strawberry sauce. If you want, you could add a teaspoon or two of honey or sugar or whatever you like. It shouldn’t affect the pancakes. Most of my recipes these days are dairy-free and vegan but unfortunately I couldn’t find a way to veganize these. Chia or flax eggs might work in place of the eggs (though I’m not sure) and dairy-free yogurt would work for the Greek yogurt, but then there’s cottage cheese. And I can’t think of a good sub. These banana pancakes can also be made gluten-free and also have a vegan option! I usually have a batch sitting in my freezer for emergency snacks. Pour the oats in the food processor pulse about 5-10 times until they're chopped more finely. Then add all the other ingredients and mix until thoroughly combined. There definitely shouldn't be any lumps. Heat a non-stick medium pan over medium heat. Make a 5" pancakes and cook for about 2 minutes before flipping over and cooking for another 1-2 minutes. 53 comments on “Protein Pancakes (gluten-free, whole grain options)” — Add one! What the easiest way to show this recipe. It looks delicious, I will definitely try it as soon as possible. Made these and they were delicious! I love how thin they are. I cooked them on medium/low for a little longer than the recipe said to so that they were not quite as mushy in the middle as my first batch. Served with maple syrup or blueberry jam. Thanks for the creative recipe! The color of pancalkes is so attractive. This definitely makes the cut! Thank you for sharing. Ccan’t wait to try it at home and report back with my results! Now this is a great way to start the day. Love how fluffy and delicious they look! It’s been ages since I’ve made pancakes for breakfast. They always sound a little too indulgent in the a.m. So I love the idea of going protein-powered with them! I’m with you! I always end up in a carb coma. But not with these! I wonder what a sub for cottage cheese would be? I wouldn’t be surprised to see something come on the markets this year… the tricky part is to ensure it is as protein packed as cottage cheese. I will definitely need to try these next time I need to clean out the fridge! Seriously would have loved this two weeks ago when we had 3 containers about to expire. Aww, I just hate it when that happens. Hopefully you found a good use for them! :) And you’re right… they’re always coming up with great dairy alternatives. Hopefully there’ll soon be a sub for cottage cheese! 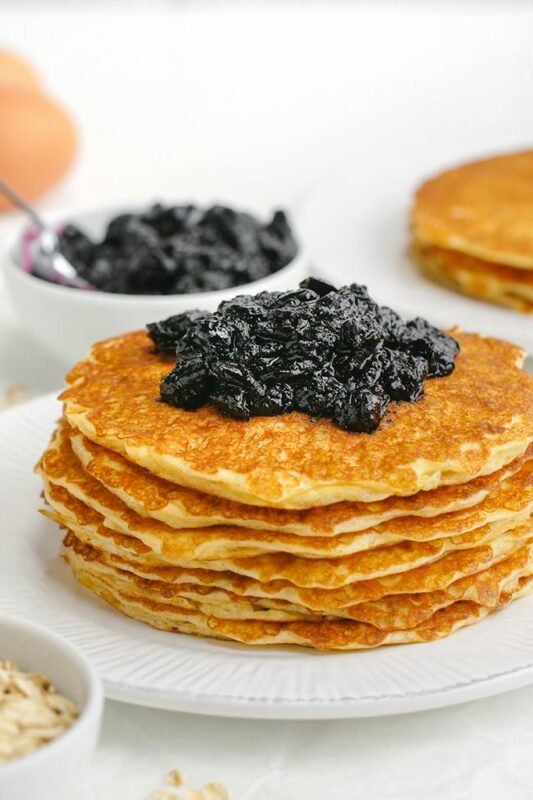 Those pancakes look quite yummy and yes, it is more tricky to sub for cottage cheese when looking for a vegan option. I have to make my own, which is a few extra steps. My fav thing is watching your videos…they are just too fun. Thank you! I’m happy you like the videos. And do you have a recipe for cottage cheese? I can link to it in my post! These look delicious! I’ve never added cottage cheese to my pancakes, can’t wait to try it!!! I’d love to try and veganize these, they look so wonderful stacked up in your photo! We adore pancakes for breakfast and dinner and theres nothing better than making things a little healthier right? Thanks for sharing your recipe! 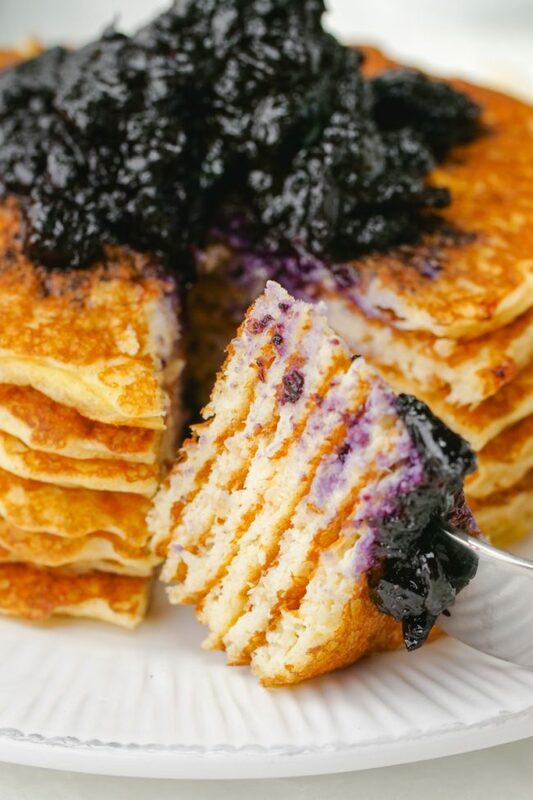 These pancakes look so delicious and perfect for brunch! YUM! These are making me want pancakes. It has been a long time since I ate pancakes. I make them every Sat. during hunting season for our grandson and his other grandfather. Which is also our son’s father in law and our pastor. HA!! They are not healthy pancakes by any means. Think these would work with ricotta substituted for the cottage cheese? I made these pancakes and like you said, they are ultra soft! I served them with your strawberry sauce, which was also really fantastic. We didn’t have any left-over, but I have a question for next time- you said that they taste good cold and I’m curious about whether they taste good reheated. Thank you very much! Hey Diana! I’m so sorry for my slow reply. I didn’t notice this comment until now. :( I’m really happy to hear that you liked the pancakes and the sauce! They taste great reheated so feel free to double or quadruple the batch next time. :) Thanks for your feedback! I’m happy you liked the pancakes, Brian. :) Thanks for the rating! I tried these pancakes tonight :) They were really nice. I didn't get six 5" pancakes, but I did get eight 3-3.5" pancakes. I could taste the yogurt just a little bit, but I couldn't taste the cottage cheese at all, just like you said :) I'll be making these again soon. prairiesummers – Haha. Good that I'm not alone! Made these pancakes for my Hubs and me. He's not a sweet tooth really so we had with sausage and egg. They were incredible. A great idea for using up cottage cheese (which is unfairly maligned by many). A great easy start to a lovely Sunday. Yuuummmmmmm!!!! Erin, I'm dying over your healthy pancakes. I'm going to print this off and force my husband to make them… since he's usually the breakfast maker in our house! YUM! Sonia – Ahaha. What the heck is a blueberry pancake batter smoothie? That sounds absolutely amazing! Thanks again for the picture comment! I got this black slate (I guess that's what it's called) thing and I love it. I want to see the smoothie recipe! And they give you needs? Haha. You leave the best comments. Oh Erin, you are killing me! Now I want pancakes big time! 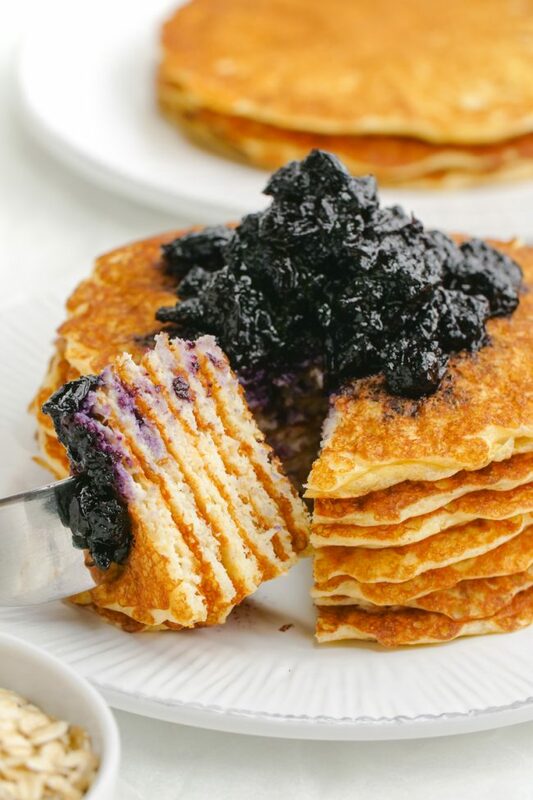 I was gonna make a Blueberry Pancake Batter Smoothie this morning, but I'm thinking I'll skip the smoothie part and just make blueberry pancakes! Love these! It's absolutely gorgeous, and I love that it's for two servings! When I make pancakes, it's usually a serving of 6-8 and there's only me and Jason! Miryam – Yup! I made mine on medium. Exactly on medium. But I can't even imagine burning these. Different batters burn differently, at least with me. I've made pancakes before where it's difficult to flip them before they're already burned, if that makes sense. Good luck with your pancake making! Or you could make these, see that they don't burn, and then have a recipe from your good old pal Erin in your cookbook. :D Just kidding! Amy – Yeah! The big ones are just too bready. Blah. yum, these sound wonderful! i prefer thin pancakes over big 'ol thick ones, too, so i bet i'd love these! These are the ones you posted on FB a few days ago :-) They look perfect. My recipe also uses cottage cheese and Greek yogurt, although I use egg whites and some other things in it!! I love how little flour this has though and how great they turned out. They say that the trick of making perfect pancakes is the temperature at which you cook them. Maybe that is my mistake because mine always turn sort of burnt. What temperature did you cooked them at? I think medium to low is what is recommended but I am not sure. Katrina – I hope you like them! Erin, these look great. Wonder what we might do to make these into waffles besides a waffle maker, of course.